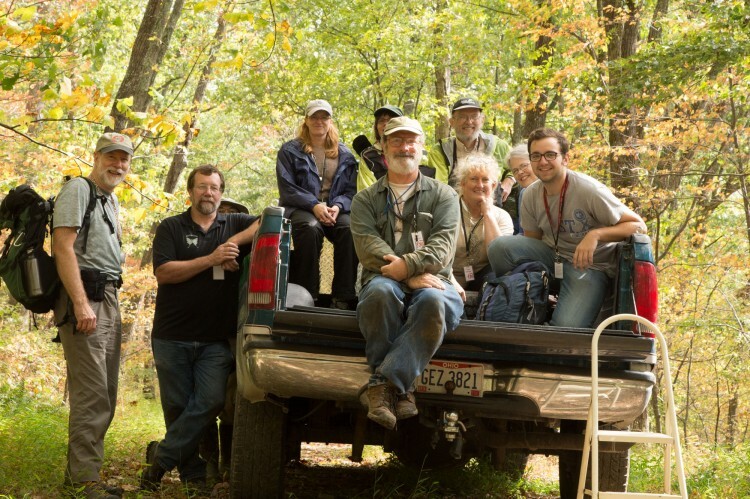 To commemorate OMLA’s 10th anniversary, we returned to the scene of our first-ever foray, beautiful Adams County in southern Ohio. Exploration began on Friday afternoon, where we were privileged to explore the General Electric Engine Testing facility in northeastern Adams County. Our host was John Howard, a GE employee who is also a keen, enthusiastic, and friendly naturalist. This is a large, remote area (so that the noise doesn’t bother nearby neighbors). This largely undeveloped area contains a variety of habitats and is normally off-limits. We were fortunate to be able to visit it. We piled in a truck. That was fun! This area has some open wooded hillsides that were great for cryptogams. Tree bark is generally pretty good moss substrate, but (except for Orthotrichum and Ulota) most corticolous mosses occur at the base of a tree, not very high up. A delightful exception, not very often encountered, is Forsstroemia trichomitria. Forsstroemia trichomitria and Janet carry on a conversation. 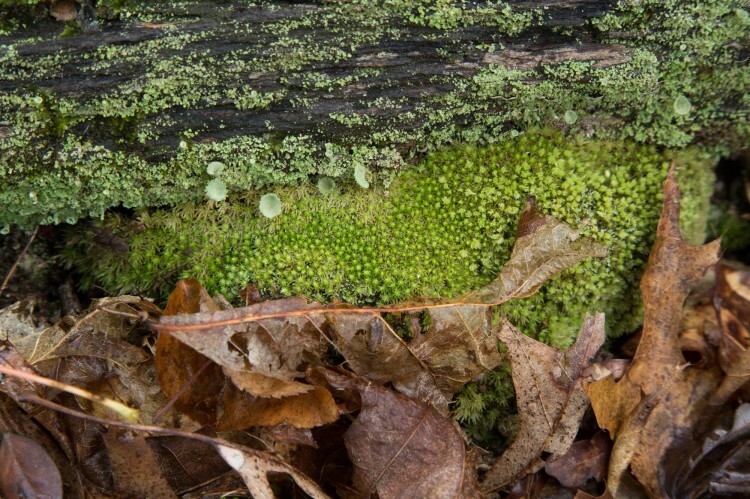 Like the people who study them, mosses and lichens often occur together. Here along the margin of a case-hardened hunk of coarse woody debris, Leucobryum glaucum (or, perhaps more likely, L. albidum) and one of the “pixie cup” cladonias nestle together. 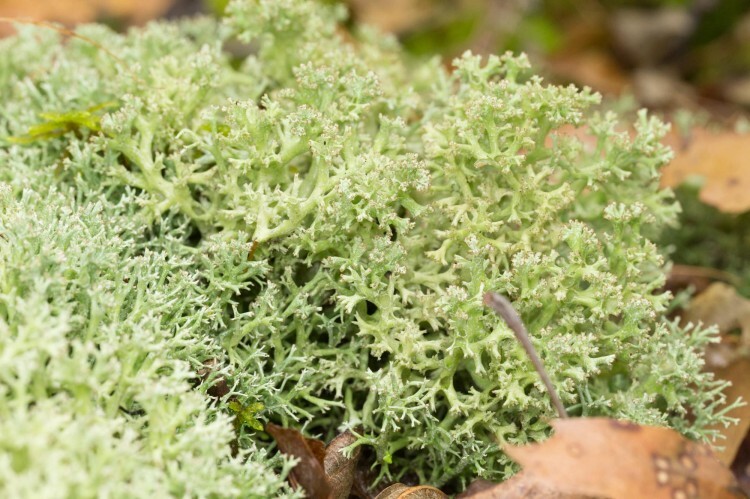 The lichen genus Cladonia includes several species of tangled ones informally called “reindeer lichens.” This is one of them, Cladonia uncialis. 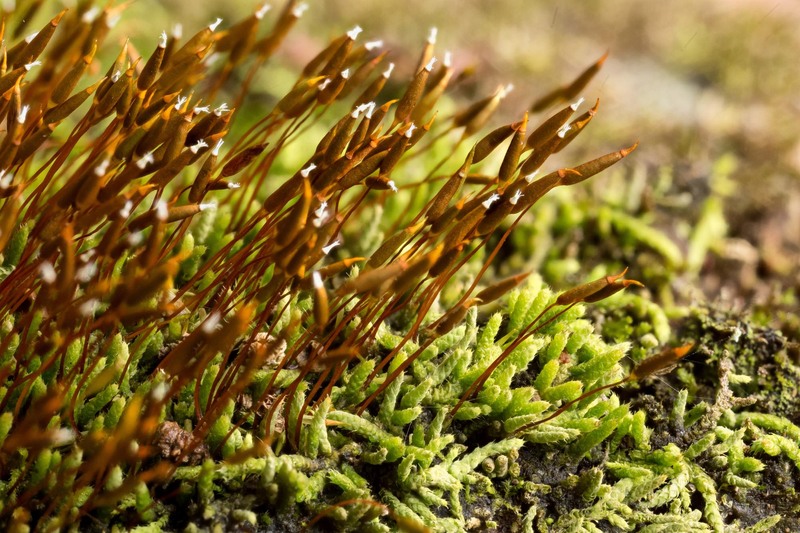 A moss of extraordinary form is Diphyscium foliosum. The gametophyte leaves are dark, strap-shaped and easy to miss if they are by themselves on the rocks or acid organic soil, often thinly covering rocks. 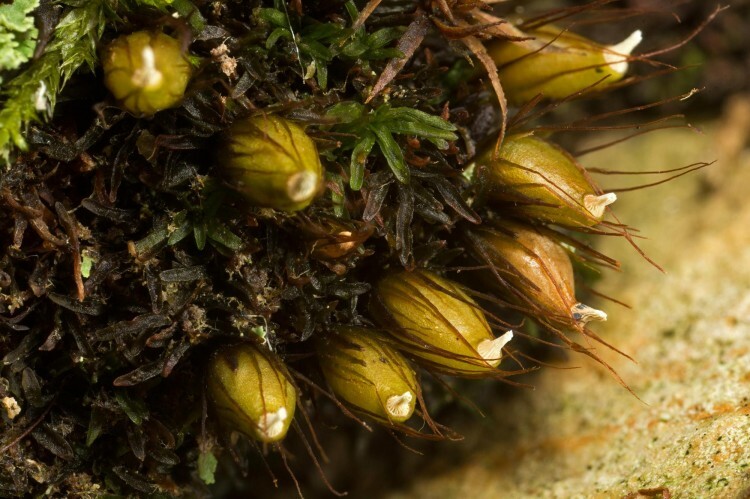 When sporophytes are present, the moss is unmistakable, as the capsules are sessile, and resemble (somewhat) a grain of wheat. 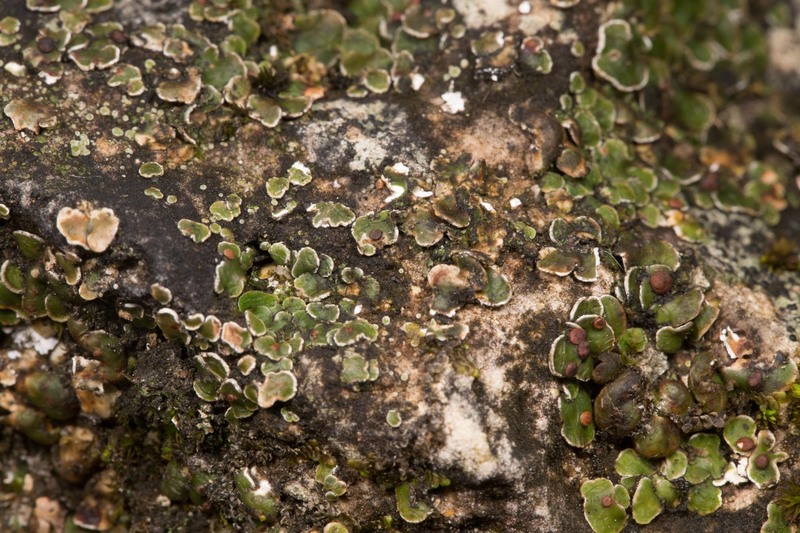 Something else wonderful, but neither lichen nor moss, came to us from the animal kingdom. This is a very special “mole” (i.e., lunged, as opposed to your typical “lungless” salamander, i.e., the little ones. such as the red-backed, that you find beneath logs and rocks). It’s the marbled salamander, Ambystoma opacum. Unlike our other Ambystoma species, which breed in wet vernal vernal pools in late winter/early spring, this one breeds in such pools in autumn, when they are largely dried up. The large wet eggs that are protected by the female, and over-winter until they hatch the following year, when the pools are full. 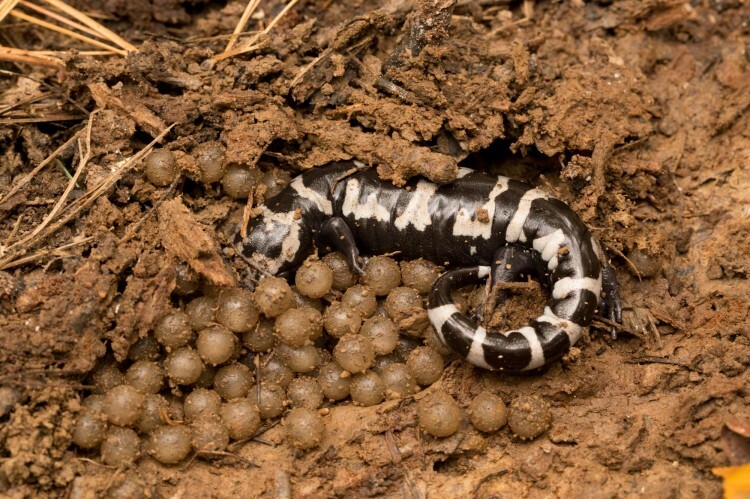 Marbled salamander protects a clutch of large water-filled eggs. The location of Saturday’s expeditions was the Edge of Appalachia. The “Edge” is a magnificent 16,000 acre system of 11 preserves, 4 of which are National Natural Landmarks. It is administered jointly by the Cincinnati Museum Center and the Ohio Chapter of the Nature Conservancy. 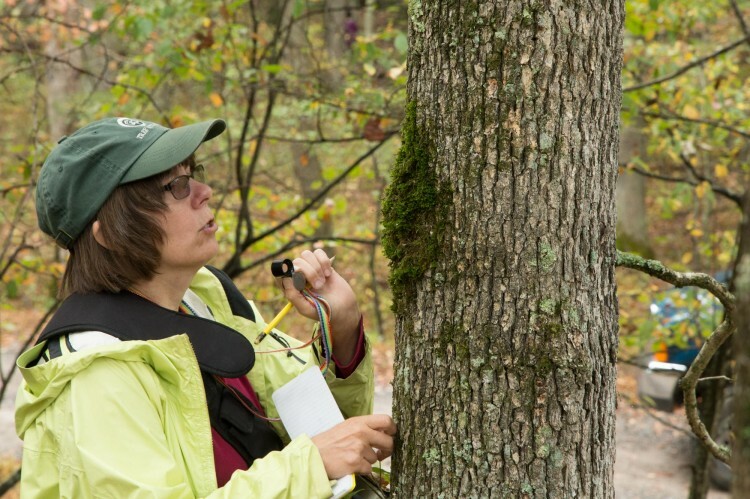 This video explains it well, and also mentions that there are lot of lichens in this region of the state! Saturday morning was spent at Charles A. Eulett Wilderness Preserve Trail. This area includes both forest and open glade with exposed dolomite. This type of rock is an excellent lichen substrate, and its prevalence here in Adams County is partly the reason why Adams, with 160 species, is Ohio’s leading county for lichen diversity. We saw this squamulose lichen, Psora pseudorussellii. Psora pseudorussellii on the rocks. On a sun-baked tree stump nearby, we saw a distinctive gray-green moss with worm-like stems arranged in a roughly feather-like (pinnate) arrangement. It was producing abundant sporophytes. This is Thelia asprella. Thelia asprella is a julaceous pleurocarp. About mid-day we gathered for an “official” group picture. OMLA at Wilderness. October 4, 2014. After lunch we went to the Christian and Emma Goetz Buzzardroost Rock Preserve, an older preserve (opened in 1967) but one which just this year has had an additional section of trail added, plus a new trailhead. Here we saw rather extravagant growth of a distincntive moss, Fissidens taxifolius. The genus Fissidens can be distinguished from most other mosses by it arrangement of leaves, in strict two-ranked fashion. 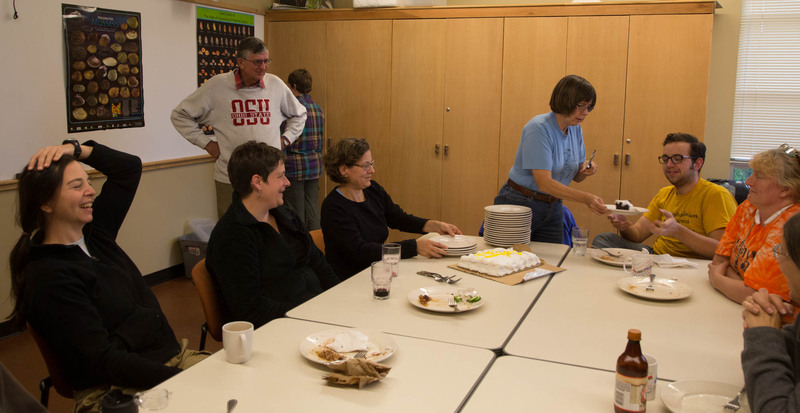 In the evening we had a wonderful dinner of pulled pork and other goodies in the Eulett Center dining room. It was also the occasion of the OMLA birthday celebration. Hooray! 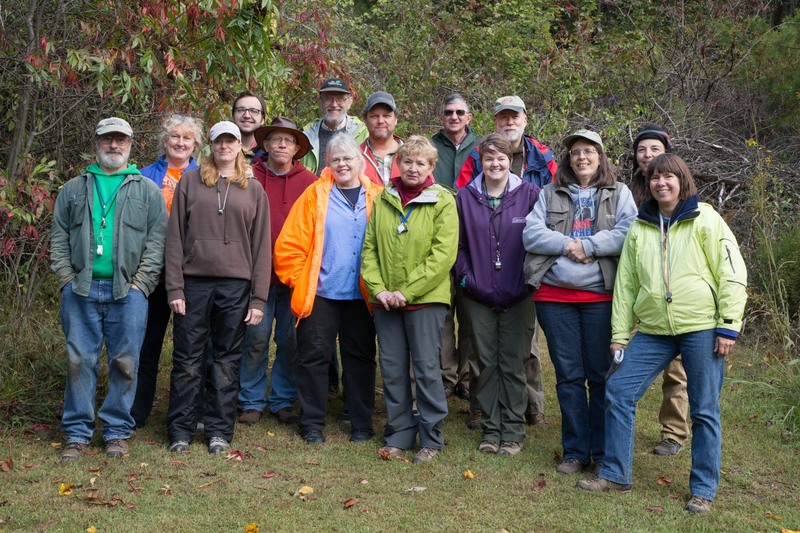 Sunday morning was spent at at Nature Conservancy property in Pike County, Strait Creek Prairie Bluff Preserve, where we were met by former TNC Land Manager Dave Minney. 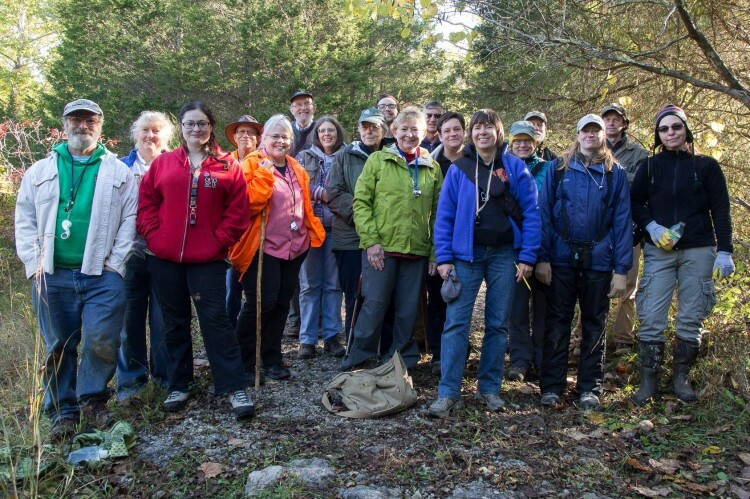 Davegraciously showed us around, and explained the unique botany and geology of the area –a forested creek valley, prairie glades and a dolomite cliffs ridge system.We also posed for yet another group photo. Sunday morning at Strait Creek Preserve, Pike County, Ohio. Several plants with “moss” in their common name are decidedly not mosses, although one could be forgiven for thinking so. 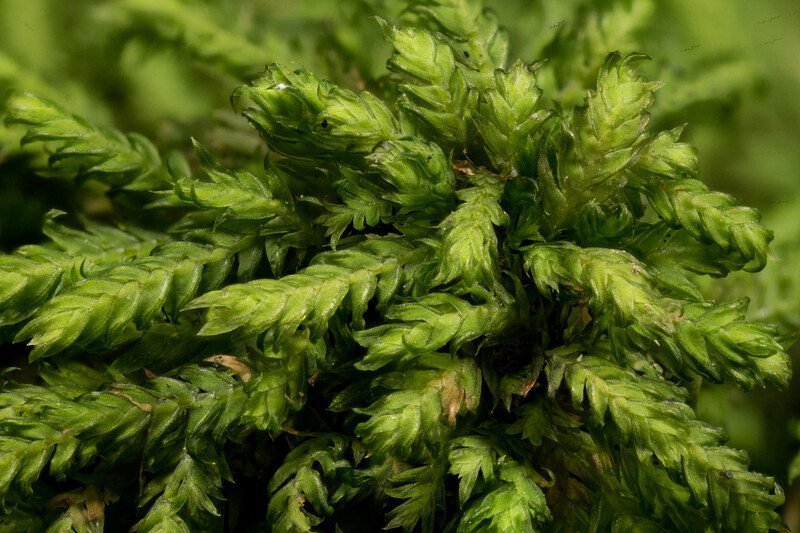 Here’s meadow spikemoss, Selaginella apoda. 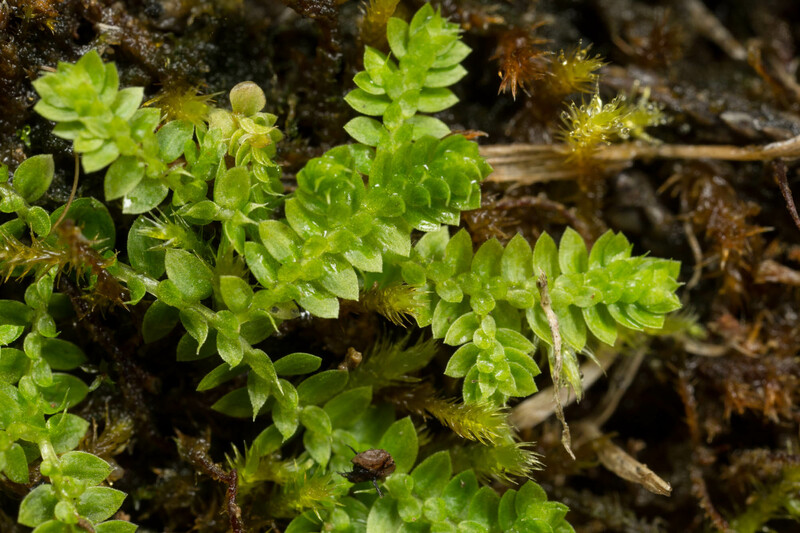 This is a primitive (seedless) vascular plant, similar in some ways to the also-misnamed clubmosses, and like them, are classified as “lycopods” (phylum Lycopodophyta). Meadow spikemoss is a vascular plant in the phylum Lycopodophyta. For further information about this most excellent foray, including moss and lichen species lists, look in the December 2014 volume of the Association’s newsletter, OBELISK.